Electronic cigarette design is often about either topper or the battery and infrequently about both. 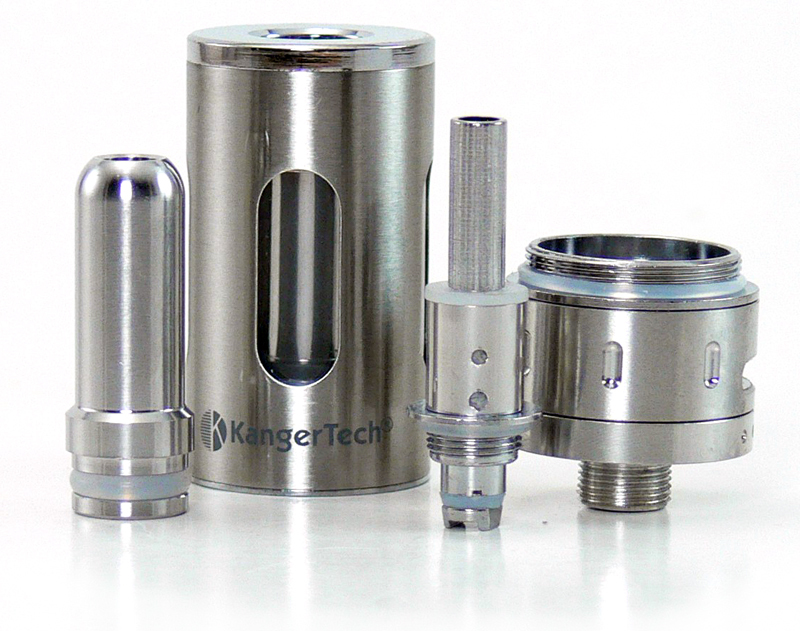 KangerTech has apparently decided to make batteries that look good with its successful line of clearomizer tanks. The new EMOW is an example of a battery and topper that are obviously made for each other, and like a celebrity couple, they look great together. Try as I might I haven’t been able to come up with a good meaning for “EMOW,” though. I really like this kit not only for it’s good looks, but for it’s performance right out of the box. The 1600mAh EMOW Mega kit includes everything needed to start vaping except the e-liquid. Once the tank is filled with your choice of e-liquid, it’s ready to vape with no adjustment or tinkering needed. Of course, an initial charge on the battery is recommended, but it took less than an hour to top off the charge it shipped with. The 1.8ml dual bottom coil clearomizer is probably the best rendition of the Aerotank design yet. Its brushed chrome housing surrounds a Pyrex glass tube and there are four windows which allow for an easy view of ejuice level. It’s extremely easy to fill by just unscrewing the base and dripping into the tank. 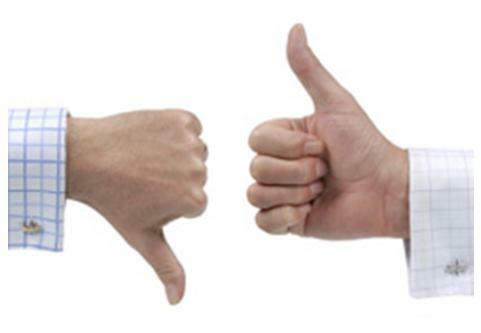 As with other clearomizers, a 1/2 to 3/4 tank fill is recommended. A nice air pocket in the tank goes a long way towards effective wicking of juice to the coil. The bottom dual coil atomizer head has been redesigned with the coil completely wrapped inside of the head, with holes for e-liquid feed to a porous inner sleeve and then to the actual coil wicks. The head is replaceable, allowing this tank to provide a long service time. Five additional coil heads are included with the kit, so it’s possible that no additional expenditures will be needed for months. These heads are also interchangeable with Protank 3, Aerotank, EVOD 2 and other clearomizers from Kanger. As with the Aerotank, the coil head screws into the base, which is a nicely updated version of the one on the former model. Instead of a band that adjusts up and down to cover a single air hole, the band now can be rotated to open or close a series of five air holes. The results are excellent, as the air flow can be varied from completely closed to wide open. The band is just stiff enough to avoid inadvertent movement. A removable drip tip in the fashion of the one found on some rebuildable atomizers caps off the EMOW clearomizer. The top portion of the tank is not removable from the glass tank, however. The bottom of the tank has a typical 510 fitting, so it will work with a wide variety of devices. There is also a trim ring included to cover the threads of the EMOW battery for a smooth appearance. The variable voltage EMOW battery is perfectly mated to the tank, making for a great looking device when it is all put together. In our kit, both pieces were surfaced in brushed chrome with bright chrome accents for a very nice effect. The battery is just a little wider than a typical eGo at 20mm and just a little longer at 116mm. The added girth allows for a whopping 1600mAh of stated battery capacity, good enough for a day or two of vaping for the average user. Voltage can be adjusted from 3.2 to 4.8 volts using the dial on the bottom. Somewhat hard to see numbers around the bottom indicate what the voltage is set to and there are stops at the high and low ends. Note that there is another version of the EMOW on the market that has only three voltage settings at 3.7, 4.2 and 4.8v, but this one offers the full range between 3.2 and 4.8. I was happy to see this battery delivering full voltage during some tests under load. With it set at 4.8 volts with the included 2.0 ohm tank attached it delivered the full 4.8 volts. Good stuff for a rather small device. 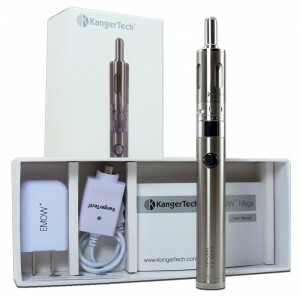 The button on the EMOW battery follows the design of recent Kanger batteries, which is to say it’s flush with the body. There is a white ring around the button that lights when it is pressed. The light also apparently will blink 15 times to let you know that it needs to be recharged. That’s probably the only thing I would change. I would much rather have a button light that changes colors as the battery charge diminishes. Charging the battery is accomplished with a USB charger that also includes a wall adapter. The smooth button can be a little hard to find by touch sometimes, but makes for a much more elegant look and helps to minimize the risk of inadvertent firing. Five quick presses of the button turn the battery on and off, making it great for the pocket or purse. As mentioned earlier, the EMOW battery delivers an impressive amount of voltage. 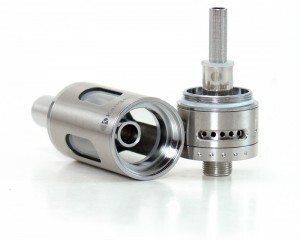 It functions quite well with the included 2.0 ohm equipped tanks across the entire range of voltages. 3.2 volts provides a nice cool vape while 4.8 volts delivers a somewhat intense one. The fully adjustable dial allows the user to find a happy setting anywhere in between. The included tank is just as user friendly and performs well across the entire range. It also appears to be fairly resistant to burnt hits when running a little to dry. It wicks very well with average thickness juices, but the wick tended to get a little dry with thicker liquids. It did not immediately give off a harsh vape, however, and the flavor just seemed to taper off instead. Battery life between charges was excellent, as can be expected with a 1600mAh battery. I was easily able to drain a few tanks before recharging. That should translate to a day’s worth of use for most vapers and maybe more. The size, good looks and performance put the EMOW kit solidly on the recommended list for new and relatively new vapers. It’s easy enough to use to be a good first kit, yet the variable voltage, large battery capacity and reliable bottom coil tank mean that it won’t be quickly outgrown. The respectable power output of the battery and proven performance of the Kanger tank make it a good choice for even an experienced vaper looking for a lightweight pocket device. This kit was provided by the folks at Goodejuice for the purposes of this review and is available for $54.99. At that price it’s not a bargain starter kit, but considering the high capacity battery, bottom coil tank and five replaceable coils it’s a pretty good value. The good looks don’t hurt either. Now if I just knew what the “EMOW” is all about!